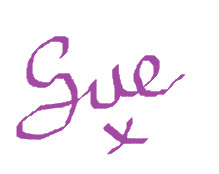 Sue, Thank you for having me on your blog. This is my first time ever for guest posting, so I'm really excited about it. I decided to design a free crochet pattern. This is a very simple single crochet beanie suitable for a beginner. The only stitches used in this pattern are the single crochet and one round of the crossed double crochet. 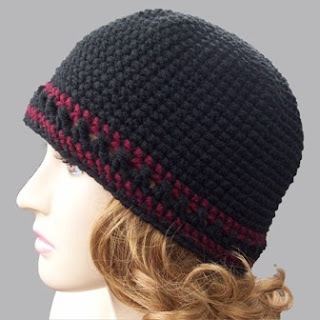 The beanie is easy to adjust in size and can be worn by men or women. Finished Size: Suitable for Men or Women. When lying flat it measures 11" across and 8" from top to bottom. The hat is quite roomy on a 20" head. For a smaller size, use a smaller hook or do fewer repeats of the increase rounds. Crossed DC Stitch: Skip a st and dc into next st, then backtrack and dc into skipped st. When working into the skipped st, yo and insert your hk from the front as normal, yarn over at back and finish the dc as normal. Note: For a larger size continue with the increase rounds as established making 6 increases in each round. For a smaller size, do fewer increase rounds. Rnds 13-24: Sc in each st around; place st marker in last st of each rnd to keep track. Continue with this round until you are 1.5" away from desired length. Rnd 25: Sl st into next st, ch 1, sc in same st and into each st around; join with sl st to first sc. Rnd 28: Join CC in first st, ch 1, sc in same st as join, sc into next st and into each st around; join with sl st to first sc. Rnd 29: Sk first st where sl st was made, Join MC in next st, ch 2 (does not count as stitch), dc in same st, backtrack and dc in skipped st where sl st was made (first crossed dc made), *sk next st, dc in next st, dc in skipped st; rep from * around; join with sl st to first dc. Rnd 30: Join CC in first st, ch 1, sc in same st as join, sc into next st and into each st around; join with sl st to first sc. Rnd 31: Join MC in first st, ch 1, sc in same st as join, sc into next st and into each st around; join with sl st to first sc. FO. You can find more of my free patterns at my website CrochetN’Crafts. I am also the owner of Crochet Pattern Bonanza, a free crochet pattern directory. I hope you will all thank Rhelena for kindly sharing her pattern. Please visit her sites as she has other fantastic patterns for you to see. Rhelena, it is so nice to see you on Susan's blog. I've been waiting for this pattern ever since you showed the sneak peek. What a lovely pattern. Thanks Sara! I know I'm super excited to have the opportunity to be here. Great to see you here, Rhelena! Great pattern, too. Thanks for sharing. Your hat looks really great and I'm planning to try making it. Thank you for posting it. Is there anything I'm missing in the pattern, though. It goes from round 25 to round 28. Answer or not, I do plan to give it a shot. Once again, thank you!